~ «Mergand, învățați toate neamurile!…». Blog de susținere românească a misiunii ortodoxe de pretutindeni, adică a slujirii apostolice ortodoxe. Despre bucuria duhovnicească a slujirii lui Dumnezeu și aproapelui aflat în afara Bisericii, o bucurie ce izvorăște în chip firesc tocmai din bucuria împărtășirii din Hristos în Duhul Sfânt prin Tainele Bisericii. Textul uneia dintre cărţile noastre mai vechi, conţinând o serie de argumente ştiinţifice care contestă veridicitatea ipotezei conform căreia fiinţele vii au evoluat. Duminica, 13 august 2014, a fost inaugurata la Pyongyang prima biserica ortodoxa rusa in Coreea de Nord. Infiintarea acestei biserici pe teritoriul Coreei comuniste vrea sa duca la o imbunatatire a relatiilor ruso-coreene, a afirmat seful de Comitet al Bisericii Ortodoxe Coreene, Ho Il Jin. De asemenea, el a mai afirmat ca ‘Guvernul coreean va administra cu succes aceasta biserica’. Noul lacas de cult ortodox va oferi ocazia credinciosilor sa poata merge la sfintele slujbe ori de cate ori se vor afla in vizita in capitala Pyongyang. Insa, fondarea primei biserici ortodoxe pe teritoriul Coreei de Nord nu indica faptul ca tara se indreapta catre o sprijinire a practicii religioase. Practica libera a religiei este garantata de Constitutia coreeana dar, de fapt, nu exista libertate religioasa. De-a lungul anilor, organizatiile umanitare au semjnalat persecutiile asupra crestinilor practicanti in aceasta tara izolata. Se va construi o biserica ortodoxa in Coreea de NordSanctitatea Sa Alexei al II-lea, Patriarhul Moscovei si al intregii Rusii, si-a exprimat bucuria fata de initiativa Coreei de Nord de a construi o biserica ortodoxa in Pyongyang. In cadrul unei intalniri cu delegatia nord-coreeana, condusa de catre Pak Ui Chun, ambasadorul Coreei de Nord la Moscova, Sanctitatea Sa Alexei al II-lea a afirmat ca ‘Biserica ortodoxa din Pyongyang este o punte de legatura intre poporul rus si cel coreean’. Delegatia amintita a luat parte la slujba Sfintei Liturghii care a avut loc marti, in Catedrala ‘Adormirea Maicii Domnului’ din Kremlin. Pana in acest moment exista o singura parohie ortodoxa in Coreea de Nord care, insa, nu are biserica, slujbele fiind tinute pana acum in cladirea Ambasadei Rusiei sau la cimitirul rus din Phenian. Constructia noii biserici ortodoxe a inceput in anul 2003 si se va finaliza anul urmator. Comentariul Misiune în Africa: cine ştie ceva de scrierile Sf. Nicolae Luminătorul Japoniei, cel Întocmai cu Apostolii? Urmăriţi filmarea la adresa de mai sus! Hierodeacon Nikolai (Ono) comes from an old family of priests of the Japanese Orthodox Church. His great-great grandfather’s name—Priest John Ono—is often mentioned in the diaries of St1. Nicholas of Japan. We talk with Fr. Nikolai about his family and Orthodox churches of Japan and Russia. Fr. Nikolai, please tell us about your family. On my father’s side, my family was Samurai. They lived in the city of Sendai in northeast Japan. My great-great grandfather, Ono Syogoro Sigenobu, was the last Samurai in our family. He was baptized with the name of John by St. Nicholas of Japan in 1871 and became one of the first Christians in the Japanese land. Later, John Ono was ordained a priest, was engaged in missionary work, and was the dean of the church in the city of Osaka. My great grandfather and grandfather likewise received baptism and were parishioners of the church in Kyoto. My father is also called John. Since there are no Orthodox educational institutions with government licensing, he studied in the theological department of a Protestant university in Kyoto, and after graduating he entered the Orthodox Ecclesiastical Seminary in Tokyo. After graduating from the seminary my father was ordained a deacon, then in 1990 to the rank of priest, and served in the Cathedral of the Resurrection of Christ in Tokyo, which is known as “Nikolai-do.” After that he was sent to the Church of the Annunciation in Kyoto (the cathedral of the Western Japan Eparchy), where he served as dean for about 20 years. After Kyoto, my father was once again summoned to serve in the Tokyo cathedral, where he carries out his obedience to this day. Have any old Orthodox holy items been preserved in your family? We have a photograph of St. Nicholas of Japan with his autograph, which the holy bishop himself gave to my great-great grandfather as a present. Tell us about your life in Tokyo and Kyoto. I was born in Tokyo in 1989, and lived on the property of the Tokyo Cathedral of the Resurrection of Christ. The residence of the Primate of the Japanese Orthodox Church is located in that same place. I often had occasion to see the reposed Metropolitan Theodosius (Nagasima), who would sometimes treat me to sweets. When I was 3 years old, my whole family moved to Kyoto, as they assigned my father to be dean of the cathedral of this historical capital of Japan. After we moved we lived there permanently, and I went to school and university there. It was only in the fall of 2011 that I moved again to Tokyo, where my father was assigned in 2010. The Orthodox church in Kyoto is one of the oldest in Japan. Could you tell us about the history of this parish and contemporary parish life? The majority of the parishioners of the Annunciation Church in Kyoto are third-, fourth-, or even fifth-generation Orthodox. The church choir is also made up of parishioners. They have choir rehearsals once a month. We have a parish council and sisterhood, and we publish a newspaper. The parish began with lectures about Orthodoxy held in one of the buildings in the center of the city. At first these lectures were temporarily led by my great-great grandfather, Fr. John Ono, then by Hieromonk Sergius (Stragorodsky), the future Patriarch of Moscow and all Russia. Then the Church of the Annunciation was built—in a different place but likewise in the city center—and was consecrated in 1903 by St. Nicholas of Japan. In 1986 the Kyoto city government recognized the church as part of the city’s cultural heritage. Russian parishioners also attend the church, and foreign students from other Orthodox countries. Sometimes non-Orthodox Japanese also come, including young people. Most of them are simply interested in the unusual architecture in the center of Japan’s historical center, but some of them begin to come to church regularly and are baptized. Approximately once a year students from a Protestant university come on an excursion. Do you remember His Holiness Patriarch Alexy II’s visit to Kyoto? At that time, in May of 2000, when I was 10 years old, His Holiness Alexy II, Patriarch of Moscow and All Russia, accompanied by the Chairman of DECR2, Metropolitan Kirill—now His Holiness the Patriarch—made the first Patriarchal visit in the history of the Japanese Orthodox Church. He headed the liturgy and enthronement of Daniel, Archbishop of Tokyo and Metropolitan of All Japan, in the “Nikolai-do” Cathedral in Tokyo. 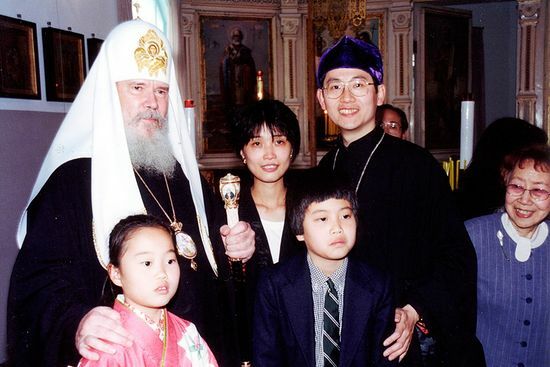 His Holiness Patriarch Alexy in the Cathedral in Kyoto in 2000, with Fr. John Ono, Matushka Sarah Ono and their children—Alexy (in monasticism Nikolai) and Lyubov (Charity). His Holiness the Patriarch also visited the Annunciation Cathedral in Kyoto, where my father was serving then. 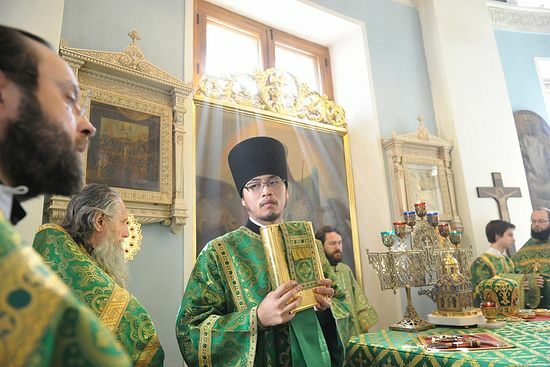 The (now) reposed Patriarch served a moleben, took a tour of the church and its revered sacred object—an altar Gospel given by St. John of Kronstadt with the inscription of St. Nicholas of Japan—and talked with the parishioners. The church was full of priests and parishioners—not only from our parish, but also from other churches in the Western Japan Eparchy. 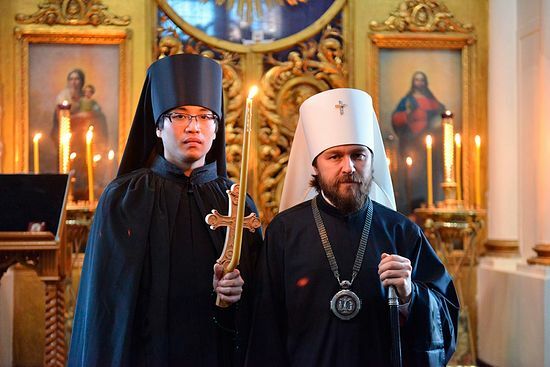 Do Japanese young people know about Orthodoxy? Are the fundamentals of the Christian Faith taught within the scope of academic subjects in schools and universities? I graduated from the law department at Kyoto State University. It seems to me that—at least at the baccalaureate level—they don’t offer subjects in Christian theology. There is only “History of Western Philosophy,” and, within the framework of this subject it talks mainly about Catholic or Protestant thinkers. Young Japanese know that Catholicism and Protestantism exist; a few know that Orthodoxy also exists, or—in literal translation from the Japanese—“the Eastern Orthodox Church.” Orthodoxy is written about in the high school world history textbook, but this is a very short description, and the narration is written from the point of view of the West. Unfortunately, few people know St. Nicholas of Japan. 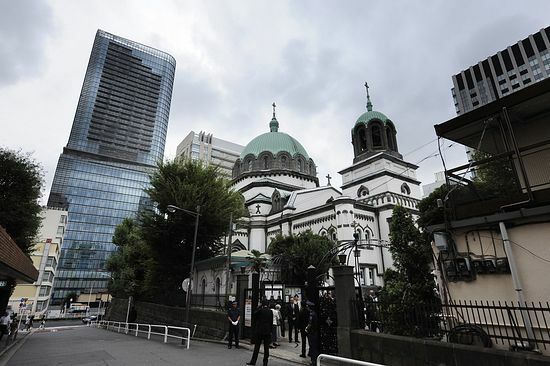 But the Cathedral of the Resurrection of Christ in Tokyo is known to all as “Nikolai-do,” that is, Nicholas’s Church. The old church in Hakokate is also quite a famous landmark. Have you been able to see many of the Orthodox churches in Japan? I lived in the churches of Tokyo and Kyoto. We used to visit the churches in Osaka and Kobe, since they were close to our church in Kyoto. I have been to the church in Sendai three times: once, I accompanied a delegation headed by His Holiness Patriarch Kirill, who visitied Japan in 2012 on the occasion of the 100th anniversary of the repose of St. Nicholas of Japan, Equal-to-the-Apostles. 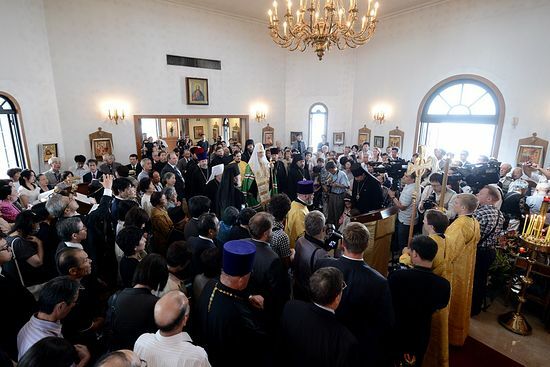 The visit of His Holiness Patriarch Kirill to the Cathedral Church of Sendai Eparchy, September 15, 2012. It was the second Patriarchal visit in the history of the Japanese Church. I’ve been living in Moscow for two years now. I’m in the second year of the Master’s program of SS. Cyril and Methodius General Church Postgraduate and Doctoral Studies, created in 2009 by the decision of the Holy Synod and on the initative of His Holiness Patriarch Kirill. The rector of this school is Metr. Hilarion of Volokolamsk, Chairman of the Department of External Church Relations of the Moscow Patriarchate. The program we have is substantial and intensive. Special attention is paid in our courses to the study of foreign languages, in particular, English. The professors of General Church Postgraduate Studies work at the Department of External Church Relations. The subject Inter-Orthodox Relations especially interests me. The professors of this discipline are people working in DECR, who are acquainted with the most pressing issues in this area. Besides the study of the required subjects, I am writing my Master’s thesis on Vladimir Lossky’s book Outline of the Mystical Theology of the Eastern Church.” In my work I wanted to show to what extent this book has interest and is topical for the Orthodox faithful of Japan. Metropolitan Hilarion of Volokalamsk and Fr. Nikolai (Ono) after his tonsure. Being a hierodeacon, I serve in the Moscow church named after the icon of the Mother of God “Joy of All Who Sorrow” on (Great) Ordynka (Street).3 After my arrival in Russia I became the subdeacon of the dean of this church, Vladyka Hilarion. And there, on April 30, 2013, I was tonsured a monk by His Eminence Metropolitan Hilarion, with the blessing of His Holiness Patriarch Kirill; and on May 5, 2013, on the day of Holy Pascha, I was also ordained by him to the rank of hierodeacon. The priests, helpers, and parishioners of this church are good, kind people. The Synodal Choir sings splendidly. For me, this church in honor of the icon of the Mother of God is beloved and dear, and holds a most important place in my heart. I also like the Novospassky Stauropegial4 Monastery, whose vicar is Vladyka Savva. I live in this monastery. There—as in the church on Ordynka—they received me very well. There they sing beautifully. I like the frescoes in the monastery churches very much. I have been in many other monasteries and churches in Moscow; I have visited St. Petersburg, Diveyevo, Rostov-on-the-Don, and other Russian cities. I especially liked St. Petersburg and Diveyevo. 1. The original Russian has sviatitel’, which is used as the title of a saint-hierarch. 3. Great Ordynka Street—one of the main streets across the Moscow River from the Kremlin, named after the Great Horde. In addition to the Church of the Mother of God “Joy of All Who Sorrow,” the Martha-Mary Convent of Mercy, founded by New Martyr Grand Duchess Elizabeth, is there, open and working, and the Tretyakov Gallery is nearby.—Trans. 4. A stauropegial monastery or church is independent of the local bishop; it is directly under the Patriarch or Synod. Sora Cristina versus lumea ortodoxă încercând a jertfi dumnezeilor neamurilor lucrarea Duhului Sfânt. „Mergand, invatati toate neamurile, botezandu-le in Numele Tatalui si al Fiului si al Sfantului Duh, invatandu-le sa pazeasca toate cate v-am poruncit voua; si iata, Eu cu voi sunt in toate zilele, pana la sfarsitul veacului. Amin!” (Mat. 28. 19,20)... Daca Sf. Ap. Andrei cel Intai Chemat sau ceilalti apostoli, iudei fiind, ar fi facut misiune doar intre iudei, atunci nici romanii, nici alte neamuri nu am fi primit Evanghelia lui Hristos. Stiind, deci, ca „in dar ati luat, in dar sa dati” (Mat.) si neuitand nici ca „se cuvenea si pe aceasta sa o faceti, si pe cealalta sa nu o lasati” (Mat 23. 23), sustinem lucrarea misionara in Romania dar si in afara granitelor, prin intrajutorarea frateasca a Bisericilor locale ortodoxe de pretutindeni. DOGMATICA EMPIRICA …adică despre dogmă și experierea (ἐμπιρεία/empireia) ei în Duhul Sfant. Doar în Ortodoxie dogmele Bisericii chiar pot fi verificate prin viața mistagogică!